A message from deep space. Who will be the first to go? A journey to the heart of the universe. Starring Jodie Foster and Matthew McConaughy. Directed by Robert Zemeckis. 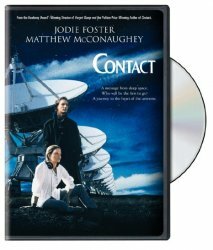 Although this movie is based on noted atheist Carl Sagan's novel and embraces his questionable worldview, it is an exciting adventure that portrays what Sagan imagines would happen on the day "we make contact with life beyond Earth." Foster is astronomer Ellie Arroway, a woman of science. McConaughey is religious scholar (apparently the generic kind and not smart enough to be a "man of science") Palmer Joss, a man of faith. They're obviously on opposite ends of the spectrum in their beliefs. Surprisingly, by the end of this powerful movie it has the unintentional effect, in our opinion, of clearly demonstrating how spiritually bankrupt and disturbing the movie's and Arroway's worldview is in the end.